As told by a recent college graduate. Mornings are hard. Unless you’re a superstar and have no trouble waking up at 5AM to head to the gym before work, getting out of your cozy and warm cloud is hard. If you’re anything like me, you milk every last possible second in bed before having to rise and shine and put your adult-face on. As a recent college graduate, I said my difficult goodbyes to the late-morning slumbers and joined the 7AM club. In college, I was notorious for always avoiding any morning classes that had a start time beginning with a single digit. My mornings were relaxing and enjoyable with several cups of French vanilla coffee, an English muffin and “The Price is Right.” Now, my mornings consist of rushing to put on a blazer while it’s still dark outside with The Today Show on in the background, as an attempt to educate myself on current events around the world. Is this #adulting? I’ve been employed full-time now for just over five months. Within those five months, I’ve struggled with adjustment – mostly, getting up early. During those same five months, I’ve come close to perfecting the process that begins once your alarm goes off to when you actually hit the road. And when I say perfecting, I mean getting everything done in as little time as possible to make room for extra zzz’s. What’s even harder than getting up in the morning? Getting up every weekday morning in the winter. Now it’s winter. It’s snowing outside, your windows are frozen over, and you have seven more layers than usual that you need to put on. The cold is fogging up your glasses and getting out of the shower becomes torturous. You’re less motivated to get out of bed on a cold day in February than a summery morning in July. In the winter, everyone wants to maximize their bed time. I’ve mastered my iPhone alarm clock, having nailed down the appropriate number of snoozes allotted on a typical morning and the magic number of back-ups needed to prevent oversleeping. I’ve mastered my personal routine of makeup and hair-care that can get me in and out of the bathroom in about 18 minutes. I’ve mastered the “Pinterest professional” mason jar salad that I make the night before and take with me for lunch the following day. Why yes, sometimes a steaming shower is just what you need to wake up. For me, the shower process from start to finish, including the blow dry and straightening, takes around an hour. Showering before bed ensures: 1) I am getting into bed squeaky clean, and 2) a quick five minute touch-up of my hair is a lot more appealing than an hour. Cue an extra 55 minutes of sleep just from showering before bed. I’m old fashioned and like brewing a pot of coffee every morning rather than popping in a K-cup. I didn’t appreciate the originality of the coffee pot as much as I do now – that wasn’t until I discovered “delay brew.” Rather than spending the 5-ish minutes in the morning rummaging for a coffee filter and making sure I have equal parts water, equal parts coffee, I get everything ready before bed. I set the timer to 7:45AM, and when the clock strikes, the pot kicks on automatically. All that’s left to do is fill up my to-go mug. 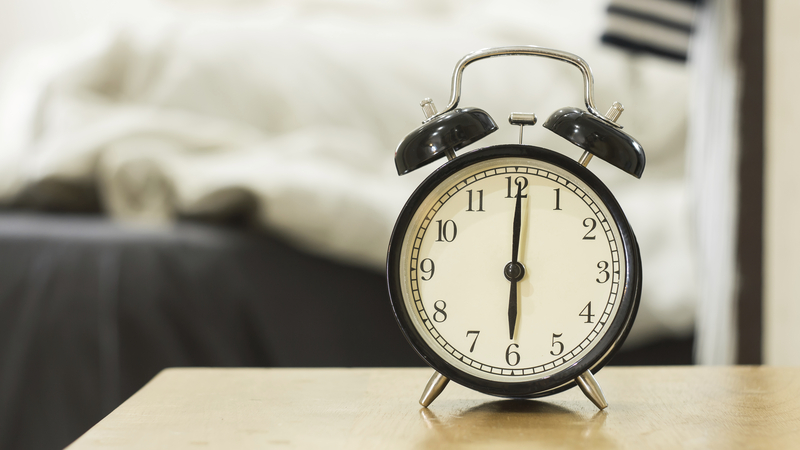 Remove that hassle from your life and gain an extra 10 minutes of sleep, give (a lot) or take (a few). With the health food trend booming in full force, especially around the holidays, making your lunch can become time consuming. All hail, Pinterest. I’ve perfected the mason jar salad – a salad you can make the night before and even include your dressing within. If you’re not a greens eater, that fifteen minutes you might take to make a sandwich, bag up some chips, and cut up some fruit, is fifteen minutes extra snoozing time you’re missing out on. In the morning, all that’s left to do is grab your lunch out of the fridge. It’s like a weight off your shoulders. Alas, an extra 15 delicious minutes of sleep (that for me personally, I owe to Pinterest). There’s nothing worse than heading out to your car and seeing a sheet of ice plastered to your windshield (and it’s not the kind you can scrape off, either). If your windows are frozen over, chances are your windshield wipers are frozen too, which eliminates the “I’ll just blast the defroster and keep spraying windshield washer fluid until my windshield melts” trick. You know you’ve started driving with a frozen windshield, because you don’t want to risk being late. And there is a baseball-sized thawed hole in the ice and you tell yourself that that’s enough to get going and the rest will thaw in a few minutes. Or the alternative – you sit in your car shivering for 10 minutes, waiting for your defroster to actually defrost and the heater to actually blow out hot air. We’re desperate for a hack. I stumbled upon a YouTube video that had been shared on Facebook. The video belongs to user Amber Thompson, who demonstrates a neat winter-hack to defrost your windshield super quickly. With two-thirds rubbing alcohol and one-third water combined in a spray bottle, the ice seems to instantaneously melt away. I have yet to try this, but I’m optimistic. Fingers crossed. I’d give yourself another 5 minutes of sleep every morning (acknowledging that the trick may not have a 100% success rate). No one has time for sunny-side-up eggs, with a side of bacon, toast, and home fries. Maybe on a Saturday morning sure, but I’d rather grab a quick yogurt and protein shake Monday through Friday. Even some toast with a side of fruit can take up more minutes than you’d think. I got all nostalgic when I began working at United Group, a Troy, NY-based commercial real estate company. Three of United Group’s student housing properties run a breakfast program called “Wake Up Wednesday.” Every Wednesday in the lobby, there’s a spread of grab-and-go foods for students to, well, grab and go to class. Why didn’t my student housing offer this? Props to College Suites at Brockport, College Suites at Plattsburgh, and College Suites at Cortland for the ingenious idea. So, maybe an extra 9 minutes of slumber if you choose not to make and eat your breakfast at home. Think of all the timeless, extra beauty sleep you’ll get every night with some minor adjustments. Even if you only get an extra 15 minutes per night because you’ve already implemented half of the time-shaving suggestions, it all adds up. I foresee an earlier wakeup call once the snow actually hits, but for now… Zzzzzzz. To learn more about United Group, visit www.ugoc.com.